Mozart, W.A., Complete Sonatas and Fantasies for Solo Piano, Dover Edition. Monday, January 8:Introduction to the course. T, Jan. 9: no class. W, Jan. 10: Triads and their inversions. Th, Jan. 11: two-hour drill of triads and inversions. M, Jan. 15: Martin Luther King Day. T, Jan 16: More drill on triads. play one note and add a fifth above, then third. Do the same with the other two inversions. W, Jan 17: Closed and open spacing. Cadences and preparations. Th, Jan. 18: SS prepare PP.88-90 and drill duets, PP. 91-93 in class. M, Jan. 22: predominants and substitutions. Harmony assignment #1 due. T, Jan. 23: SS prepare melodies 1-4, PP. 100-101. Rhythm prepare PP. 95-97. W, Jan. 24: The idea of temporary tonicization. Th, Jan. 25: SS at sight (group) PP. 102-106. M, Jan. 29: secondary dominants and the diminished seventh chord. Harmony assignment #2 due. T, Jan. 30: SS at sight (group) PP. 107-112. W, Jan. 31: interaction of the modes. M: Feb. 5: Harmony assignment # 3 due. T, Feb. 6: Dictation midterm. W, Feb. 7: Musicianship midterm. Th, Feb. 8: SS prepare PP. 122-123, drill duets PP. 124-125 at sight. M, Feb. 12: Harmony midterm. T, Feb. 13: Review of musicianship midterm. W, Feb. 14: Review of Harmony midterm. Th, Feb 15: Keyboard drill on figured bass from last chorales and altered chords. M, Feb. 19: Presidents' Day (holiday). T, Feb. 20: SS at sight drill PP/ 128-129, prepare PP. 131-132. W, Feb. 21:modulation and extended tonicization. Th, Feb. 22: SS drill PP. 142-143, prepare PP. 144-145. M, Feb. 26: altered chords, including neapolitan, augmented sixth, and borrowed chords. T, Feb. 27: SS prepare PP. 146-147, drill duets PP. 148-149. W, Feb. 28: Secondary dominants review. Th, Mar. 1: SS prepare PP. 160-161, drill PP. 156-157. M, Mar. 5: Augmented sixth chords as pivots: pivot chords in general. T, Mar. 6: SS prepare PP. 162-163. W, Mar. 7: Drill on modulations. Th, Mar. 8: SS prepare PP. 169-170. M, Mar. 12: Review modulations in sonata form and secondary dominants. T, Mar. 13: SS prepare PP. 171-173. W, Mar. 14: General review and dictation drill. Th, Mar. 15: Keyboard harmony review and drill. 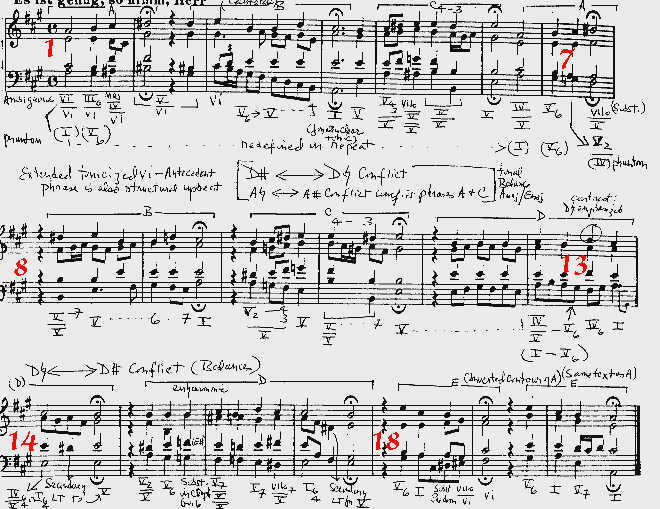 Sample analysis of a bach chorale: The music of J.S. Bach's Es is Genug (with chord symbols and phrases marked). The analysis itself. Students may seek help from the professor at the office hour, Wednesday 12:00-1:00 PM, by e-mail (p_reale@minotaurz.com), or by phone (dedicated line available until 8PM). In advance of due date, assignments may be faxed for approval. Harmony assignments involve four-part writing in Bach-Chorale style. 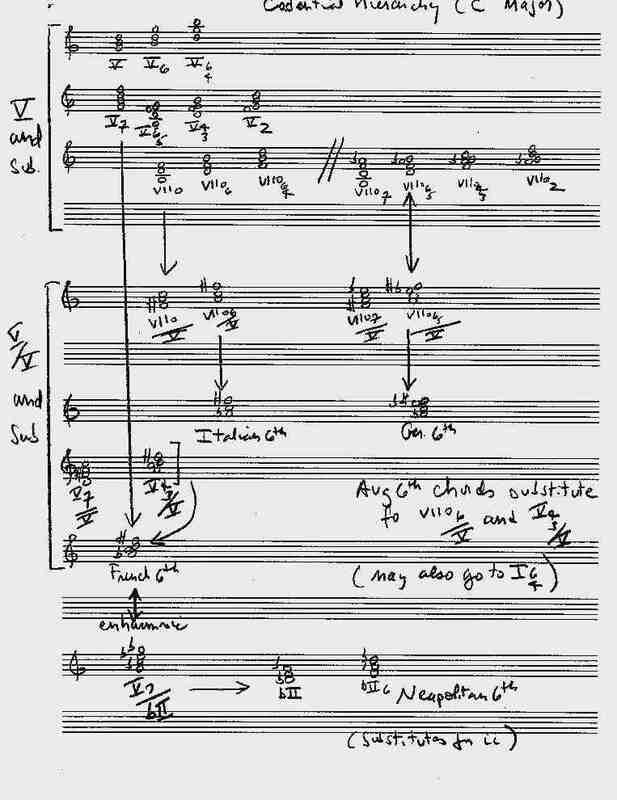 Analysis paper #1 is a differential analysis of a Bach Chorale, while #2 is a Mozart Sonata movement.